I love Doctor Who. My teenagers consider themselves Whovians. In fact, both of them have the full, unabridged Doctor Who theme in their music libraries. So, when Doctor Who: The Card Game was announced, it was a no-brainer purchase. I mean….It’s Doctor Who. It’s a Martin Wallace game. It’s gotta be good, right? In this game you play location cards and try to defend yours while taking control of the other players’ locations. You do this by playing attackers (Sontarans, Daleks, Cybermen and other Doctor Who baddies)on locations while the owners of those locations defend with The Doctor, River Song, Amy Pond and Rory. There are support cards to help you along the way. So, during the game, you’re playing both sides – The Doctor and the Baddies. There are regulations that need to be followed such as You can only have one race of attacker attacking a location (so if you play the Sontarans you can only use Sontarans, you can’t mix them with Cybermen or The Silence). The attacks are done face down, so the player being attacked has no idea the strength of the combined attacking cards. To defend, that player lays down a combination of hero cards in hopes that their combined value is greater than the attacker’s. However, you cannot play more than one Doctor or River or Amy at a time. That’s one strategic element you have to deal with. The other is hand management. You start with five cards. (I don’t know what it is with some many games starting with five cards – deck-builders for instance – but that seems to be the magic hand number.) You have a series of actions you can choose to take: Play a Location, Play Defender Cards, Play Enemy Cards, Play Support Cards, Buy extra cards with your Time Points, Place Cards in Your Reserve, or Discard Cards to get more Time Points. You can do as many actions as you want….as long as you have three cards left at the end of your turn. At that point, you pass those three cards to the person on your right. Remember that….your RIGHT. Then play passes to the LEFT with the next player doing their turns. So…you end up with no cards in your hand at the end of your turn. At the start of your next turn, you will have been given three cards from the person on your left and then you draw two to bring your hand up to five. Make sense? That little game mechanic made Doctor Who: The Card Game feel like a study in frustration. difficult than it should be. There’s a fun game to be had here. I know it. But after playing it three times with my Whovian family (who doesn’t want to play it ever again) and then a couple times with my gaming group (which has banned the game from the table), I just can’t seem to find where that fun game is. What it comes down to is: The game does not capture the intrinsic fun of Doctor Who; that whimsy and the character(s) that have made the show the longest running program in history (almost 50 years at this writing). I so so so wanted to like this game. I tried to justify it’s lack of engrossing game play. But in the end, this is a Martin Wallace and a Doctor Who game that completely misses the mark. 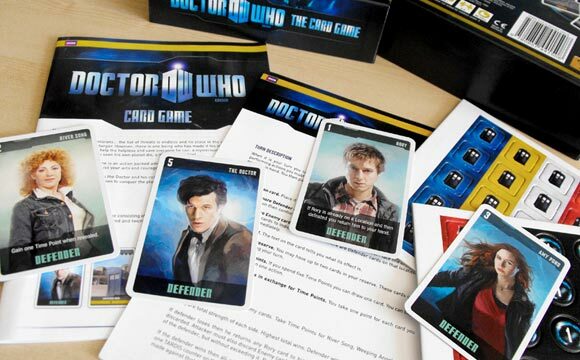 Add a Review for "Doctor Who: The Card Game"